E-commerce has been around for a while now and many businesses use it for day to day activities. With the Internet being so accessible, it is easy for both consumers and businesses to interact. But now, there is m-commerce. Is it just as important as e-commerce? Should you be paying attention? Read more to find out. M-commerce (short for mobile commerce) is the use of mobile devices, to make transactions. Services like online banking and Apple Pay are just some popular examples of m-commerce. Beginning its popularity in 2015, the amount of people preferring to make transactions on mobile devices is making a steady increase. Both operating using the Internet, the key difference between e-commerce and m-commerce is the device. E-commerce conducts business transactions through desktop and laptop computers, while m-commerce uses smartphones and tablets. Though they both derive from the same principle, m-commerce offers more flexibility with apps in addition to web stores and its overall portability. However, this comes at a price. Mobile app development isn’t always cheap, therefore making it an added cost. M-commerce is being used by companies of all industries, including supply chain. The Internet plays a huge role in our lives today, both in business and leisure. More and more businesses are turning to web-based platforms to handle relationships with customers, vendors and B2B partners. It’s simple and accessible, making exchanges between parties quick. SaaS is becoming prevalent for many businesses are expanding their reach through mobile devices. For example, look no further than Clear Spider! With the mobile app, users are able to manage their inventory on any device. Services offered include mobile barcode scanning and the ability to make real-time inventory transactions. The growth has been exponential. Worldwide mobile commerce revenues amounted to 96.34 billion U.S. dollars in 2015 and are estimated to surpass 693 billion U.S. dollars by 2019. Businesses in countries such as China, Korea and Australia are experiencing rapid growth with mobile commerce and many businesses are starting to prefer it over e-commerce. With the increase in mobile usage, it is obvious that m-commerce is on the rise. 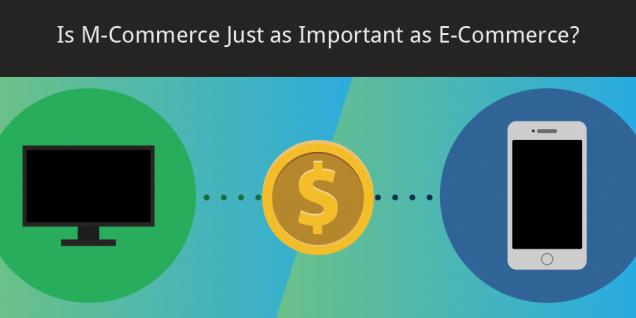 Is it just as important as e-commerce? Absolutely. Looking at its growth rate, m-commerce may even have the potential to become more relevant. Many businesses are switching to Internet based software and rely on the use of mobile devices to preform daily tasks. There is a big demand for this and it looks like its usage will continue to grow.